A while back, I went through a phase in my practice where I was doing a lot of Urdhva Prasarita Padasana. I worked on lifting my straight legs up. I worked on lowering my straight legs down. I worked on lifting and lowering in stages. I worked with my arms raised above and I worked with my arms by my side. I studied every variation carefully. I paid close attention to my inner leg, my outer leg, front leg, & back leg. I observed my heels, my toe mounds and how my feet came to the floor. Then one day, I had a revelation. It occurred to me that the tremendous lengthening that occurs from my middle groins through to my second toes when I lower my legs in Urdhva Prasarita Padasana, as well as the correlating ‘up and back’ action in the abdomen was how my front body ‘should’ feel in Salamba Sarvangasana. Salamba Sarvangasana has always been a tough pose for me. Because of the issues with my spine and the shape of my body, I have never been able to keep the weight of my legs ascending. The weight seems to drop into my lumbar and causes me significant pain. When I look at a photograph of myself, it’s clear to me that my thighs are dropping and I can’t open up my middle groins. 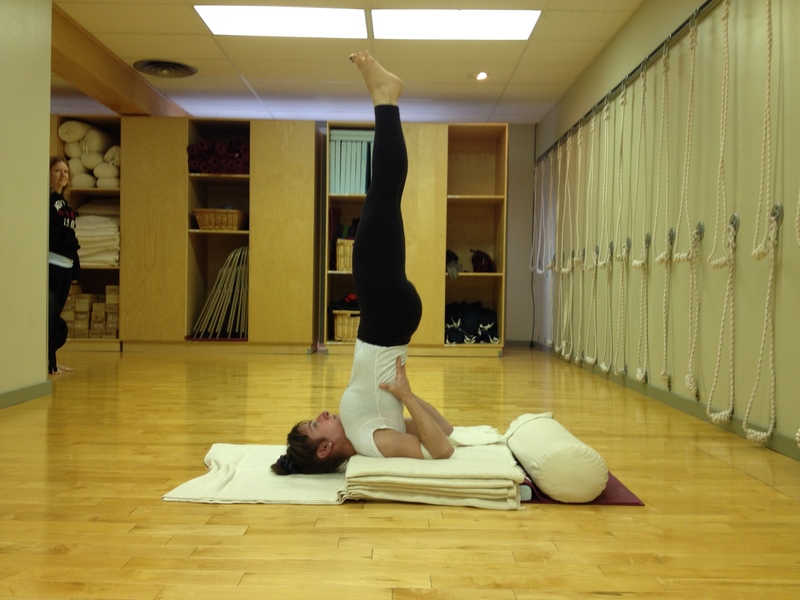 Having tight middle groins is not a new issue for me – it’s one that comes up again and again (In a previous blog post I wrote about how my tight middle groins affect my backbends)! Salamba Sarvangasana with my middle groins collapsing in. Salamba Sarvangasana with a little more openness in the middle groins. Making the connection between Urdhva Prasarita Padasana and Salamba Sarvangasana was, to me, (& I’m not exaggerating) enlightening. For some reason, Urdhva Prasarita Padasana is the only asana where I actually feel like my middle groins can open. If I hadn’t made the connection to Sarvangasana, my body wouldn’t ‘know’ what it was supposed to do in that pose. It’s not that I didn’t understand conceptually what was supposed to happen. I did, and I had heard many teaching instructions that attempted to take me there, but now because of my experience in Urdhva Prasarita Padasana, my body understands how it is supposed to feel and I can hear and interpret those teaching instructions in a new way. I still struggle with these actions in Sarvangasana, but because my cells have had a taste of what it is supposed to feel like, I’m able to work more effectively to recreate the feeling. …this brings me to my point: I think linking is an extremely powerful tool in both practice and teaching! Linking excites me because it gives me a starting point in my practice. It’s a focus – something tangible, digestible, a gateway in. It invites me to approach an asana from a new perspective and to experience an action in a new way. It also allows me to be creative but analytical at the same time. And it is through the process of linking, of understanding the nuances of the pose, of allowing my body to interpret the asanas that I am able to emancipate myself from the unnecessary chatter that goes on in my mind. That is Yoga. That is why I do Yoga. Merely understanding the details of an asana is not my goal – that can be done with exercise alone. Understanding the details of an asana is my gateway in to the ultimate goal – Yogah cittavrtti nirodhah (Yoga is the cessation of movements in the consciousness). In BKS Iyengar’s commentary on this Sutra, he explains that “Yoga is the art and science of mental discipline through which the mind becomes cultured and matured”. Do you find the details of a pose can bring you inward? Or perhaps you find the details of a pose to be a distraction? Have you come across a link that has been particularly enlightening for you? Please share! Interesting. I am not so quick to find one pose in another, although I can feel the effects of one pose on another, the ‘before’ and ‘after’. I’ll see if this connection helps me next time I tackle my nemesis.